As a Convert to the Catholic Faith this articles is very disturbing.. This has been our motto of why we crossed the Tiber River..
And now we are seeing the hierarchy working to re-define the Deposit of Faith. What if they do? What then? Where do we go? ? STEVE RAY HERE: I am in the same boat with you. But just remember that the church has Jesus Christ is the head and the pope is only the successor of Peter. Good and bad popes come and gone. Some are better than others and some are worse than others. But this is always the church and it’s been far worse in the past than it is now and it still exists and we’re still here. Don’t go anywhere just cling to Jesus Christ and his church and pray for corrections to the bad pastorale actions being implemented at the Vatican. Jesus won’t let us down! Thanks for reassuring words and guidance in a time like this. As an answer to Julie, your question reminded me of Peter… “where else do we go, Lord?” Our Lord will never abandon his bride the Church. Just remember St. Ignatius of Antioch. Do not be tempted to leave your bishop, your priest, or your deacon. For wherever Jesus Christ is, there is the Catholic Church which he long ago has founded. And nobody, not even a bad pope, nor bad bishops, can destroy the Church. Debora Gorton, you are so right! As an older Catholic I remember the less than perfect Church before Vatican II. The Holy Spirit guided Pope St. John XXIII to convene the council that gave us the universal call to holiness, a renewed appreciation for the Scripture, and eventually Pope St. John Paul II and his wonderful teachings and exhortations. 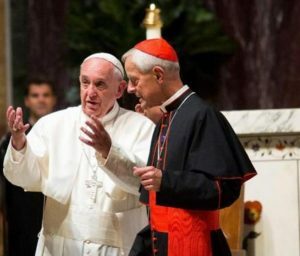 What has been mobilized is a more committed though small army of laity (and many of us are NOT traditionalists–I have no desire to go back to the Tridentine Liturgy) that can stand and proclaim the truths of the faith. We have formed communities, prayed the devotions, studied and prayed the Scriptures and raised up committed sons and daughters. Right now, from my parish, are 7 holy young men at various stages of study for the priesthood who may get ordained by flawed bishops but will be ordained non-the-less. The Catholic Church will prevail! You would have to talk very, very fast to convince me that the Church has not always called all Catholics to holiness.